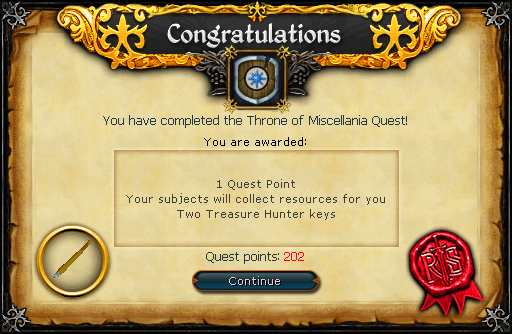 Begin by talking to King Vargas in the Kingdom of Miscellania. Note: You only need to meet one of the skill requirements listed above to complete this quest. Firstly, talk to the Sailor just north of the Rellekka market and board the ship to an island. Now head west of the port to the castle of Miscellania and go up the stairs on either the north or south end of the castle. Try to go through the Throne Room door and the guard will allow you to pass if you've completed the Heroes' Quest. Talk to King Vargas in the center of the room, and he tells you that he's cursed and needs a Regent to rule for him. Choose the "If I may be so bold" option, and he says that they are at war with Etceteria, the kingdom to the northeast. He wants you to make peace with them, and then convince either his daughter Princess Astrid if your character is a male, or his son Prince Brand if your character is a female, to marry you. Now talk to Advisor Ghrim about negotiating with Etceteria, and he suggests talking to the queen. Leave the castle and head northeast to the castle of Etceteria, and go upstairs where you will find Queen Sigrid. She tells you that she wants Etceteria to be recognized as a sovereign nation. Head back to King Vargas, and he wants Etceteria to change their anthem. Go back to the Queen, and she says that you need to find a bard to write a new one. Head back to Miscellania and talk to Prince Brand, who will write you an Awful Anthem. This anthem won't be approved of by the queen, so bring it to Advisor Ghrim who will make corrections and give you a Good Anthem. Give this to the Queen who will now give you a Treaty for the King to sign. After bringing it to him, he says that he needs a bigger pen. 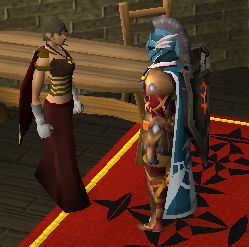 Leave the castle and talk to Derrik at the anvils to the northeast and ask to make a strange request. He needs a bar of Iron to make a Giant Nib, and then you'll need to use some logs with the nib to make a giant pen. Bring this to the King to have him sign the Treaty. Buying an Iron Rake from the gardener for 15gp and weeding the Herbs outside the castle. Mining Coal from the mine located north of the castle. Chopping Maple Trees to the east of the castle. Fishing Lobsters and Tuna from the port. You can check your rating by talking to Advisor Ghrim, or by talking to any of the civilians around the areas where you can weed, mine, woodcut, or fish at. Once you have 75% of the people's support, talk to the king. If you kill anyone your percentage will be brought down. Depending on whether your character is male or female, you'll either need to get married to Princess Astrid, or Prince Brand. First talk to the Advisor about one of them to get some tips. Use some Flowers with her, which can be bought from the Flower Girl outside of the castle for 15gp. Talk to her, and then use the "Dance" emote. Talk to her again and then use a Bow with her. Continue talking to her until she calls you "dear," and then use the "Blow Kiss" emote. Talk to her again and then use a Ring with a gem in it to propose to her. Use some Flowers with him, and then talk to him about his poems. Use the "Clap" or "Cheer" emote, and then talk to him again. Now give him a Cake and talk to him until he calls you "Darling." Use the "Blow Kiss" emote, talk to him again, and then use a Ring with a gem in it to propose to him. Once you've gotten the Prince or Princess to agree to marry you, and you have at least 75% of the people's support for becoming Regent, talk to the king who will have a short ceremony for you. You've completed the quest!